The widespread stereotyping and discrimination against people who are single has long gone unrecognized, unnamed, and unchallenged. 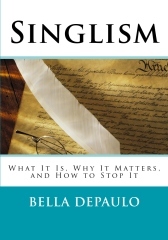 Bella DePaulo calls it SINGLISM. In “Singlism: What It Is, Why It Matters, and How to Stop It,” she – together with 28 contributors – defines singlism and shows where it is lurking in the workplace, the marketplace, the media, in religion, in pseudoscience, in laws and policies, and in our everyday lives. The authors provide some insight into why singlism persists at a time when so many other isms are considered shameful. Among the perspectives on singlism represented in the book are the personal, political, historical, religious, legal, clinical, economic, sociological, and psychological. There are media critiques, op-ed essays, and personal stories of standing up to singlism. Advocates and activists describe their successes and their challenges. Also included are sections on singlism’s cousin (the stereotyping and stigmatizing of adults with no children) and on valuing all of the important people in our lives (and not just conjugal partners and children).